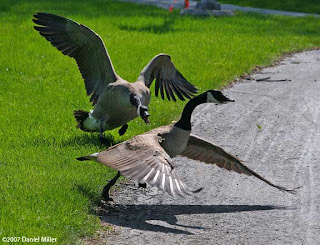 I'm not running on Sunday, but now I plan to go to the Brookmont Lock just to see the feisty geese. Those geese, especially when they're with their goslings, are vicious beasts. Yeah, I was actually running down there this morning and found myself in the worst possible goose situation. The mother goose was on one side of the path and the goslings were on the opposite site. The Goose started flapping its wings and hissing a me. As I passed, I had to grab a stick to keep the beast at bay. I expect to be passing lock 5 headed north between 8:05-8:10am. You can join in with me as I will probably still have ~10 miles to get in. Also, I commend all those who raced in the tropical humidity this evening. I was sweating buckets just standing there filming.